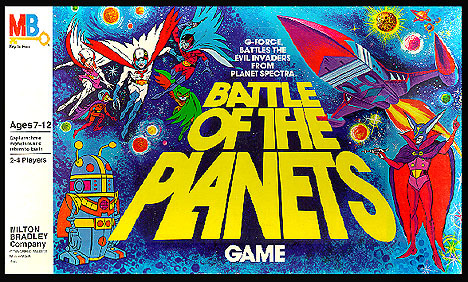 This game was made for American fans of Battle of the Planets. Strangely enough, the playing board included a picture of Gel Sadra, the villain from "Gatchaman II" who did not even appear in BotP. It came with a zark spinner, twelve "monster" cards depicting machines from Gatchaman, four Phoenix playing pieces, and an intruder playing piece. The game had very convoluted rules, which you can read by clicking here.